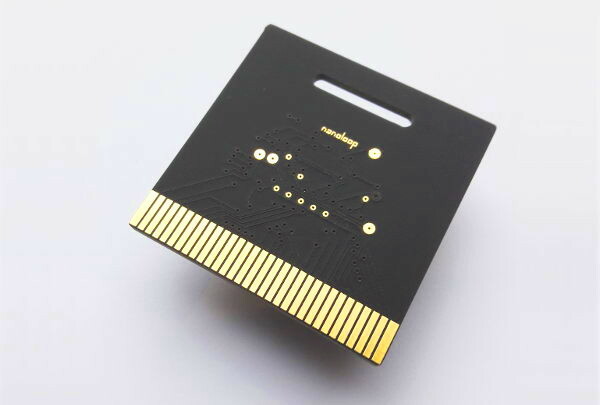 Nanoloop mono is an analog synthesizer cart for the original monochrome Game Boy models. On the original Game Boy models, one pin of the cartridge connector functions as audio input, connected to the built-in amplifier. This unique feature allows to generate sound on the cart and play it through the headphone output on a completely analog signal path. In the nanoloop mono cart, the analog components (op-amps, comparators, logic cells etc) of a PIC microcontroller are connected and configured in such a way that they form a hybrid soundchip with 3 analog filters and a true random noise generstor, using only a few passive external components. The cart is a flat but very robust PCB with all electronic parts embedded. Nanoloop mono is a stepsequencer with per-step control for all parameters. There are 8 banks of flash memory each of which can hold 15 patterns per channel and a song structure. Allthough amplitudes are the same as with internal sound, with nanoloop mono's softer characterisic, differences in audio quality are more noticeable. Some improvement is possible by adding capacitors to the Game Boy's main board ("bass mod" and "noise filter mod"). However, GB Pocket will still produce a high-pitched whine and GB color will still hum and distort basses. In conclusion, only the original Dot Matrix Game Boy can be recommended. Nanoloop mono offers the same sync options as nanoloop one.